There is a new chance to get together with people from the Neighbourhood to talk about local matters that affect you- over free tea coffee and snacks. Community organiser David Jones has set up regular but informal Tuesday and Thursday 'meetings of the people' at the Divine Nibbles cafe on Sneinton Dale. 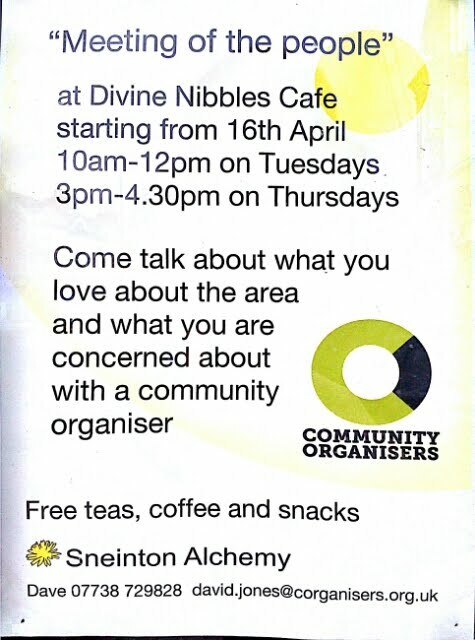 Anyone from the area will be welcome to drop in and talk about what they love about Sneinton and what concerns them. The project is part of Alchemy's Community organising programme.